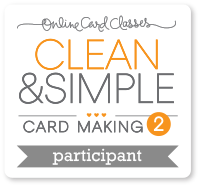 Heute gibt es einen Bonus-Tag bei der Online Card Class - es dreht sich alles um die Verwendung von Dies für CAS-Karten. Ich habe für meinen Beitrag das Rad nicht neu erfunden, sondern eher einige meiner vergangenen Karten "gemischt". Wer hier schon länger mit liest wird das merken. Ich mag nun mal Washi-Regenbögen. Außerdem ist das Thema bei CAS-ual Fridays "Love Letters". Das passt hervorragend zusammen! Und bei der perfect sentiments challenge heißt es "anything goes with a die cut. In real kann man die Karte hin und her bewegen und die Schrift besser erkennen. Nur das rote Chevron scheint das Auge zu irritieren. Spannende Erkenntsnis! This is so creative...I love all the fun, bright colors, too! Wow, Christine. I love this! How clever are you Christine. Wow. I would like to know how u did this. Did you put washi tape over the letters or under the letters or what. I am lost. Love the look and the card is fantastic. 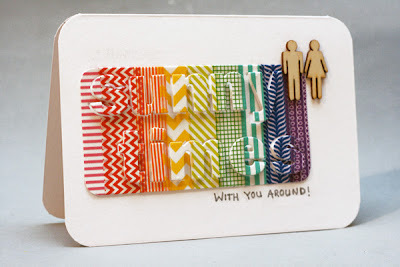 I put a rainbow of washitape on a piece of cardstock. Then I cut out the letters (my favorite things) and adhered the cardstock with the holes directly onto my card. I put the letters back into the holes again, but on dimensional adhesive. WOW Christine, das ist ja der HAMMER!!! Total genial!!! absolut genial....was für eine tolle Idee! WOW! Love this rainbow wash...great card. Not at all surprised to see this card get a shout-out! I love this technique and you have showcased it perfectly!! Brilliant! So gorgeous!!! Looks so complicated but isn't. Really brilliant job! How cute!! I love the "rainbow" you created with your paper and letters! Thanks so much for playing along with us at CAS-ual Fridays this week! This is great! so subtle and sweet! thanks for sharing! Love the look! I read your instructions and how you did this...can't believe how easy u did this! It looks like u spent forever making the letters and washi tape! Thanks for sharing! Very cool!! LOVE everything...the colors, the words you formed with your letters...all wonderful!! So happy that you were a part of the challenge this week at CAS-ual Fridays:)! !